Everyone knows that menudo is the official breakfast you have after a long night of revelry, and any will swear that it is the perfect cure for a hangover. For our family it marked the joy of Christmas and New Year, for there was always a potful on the stove to greet our relatives and friends as they performed their holiday visita. The origins of menudo, like barbacoa, are all about affirming community and relationships within a social context that, sadly, was marked by structural racism and economic poverty. The moneyed classes looked on tripe, a cow’s stomach, as inedible and they discarded it. 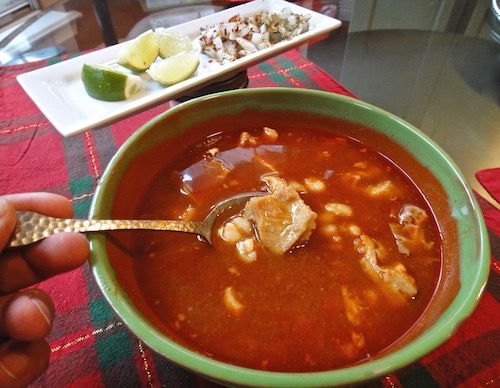 Along with other offal, it was the only protein available to poor families, so the culinary artists among them found ways to make it into the delicious and complex tasting dish that menudo is today. Expensive restaurants now serve menudo, but the best menudos are still to be found only in Mexican homes or served in barrio restaurants. Make a big batch, and serve it with lime slices, tiny diced onion, corn tortillas and sure, why not, extra oregano. 1. Wash the tripe thoroughly and cut it into 1-inch squares. boil and cook until tender. Depending on the tripe, cooking could take 3–6 hours. From time to time, skim and discard the foam that forms on the top. 3. To devein the chiles, first lay the chile flat on a cutting board and, using a paring knife, cut a slit lengthwise. Then grab the chile with one hand and with the other break off the stem. Open the chile along the slit and remove the seeds and veins. 4. In a large saucepan, cover the cleaned chiles with water and bring to a boil. Turn off the heat and let the chiles steep for 15 minutes so that they rehydrate and become tender. Drain the chiles, discarding the water. Let the chiles cool a bit so as not to damage your blender. water as needed. You will need to add 1/2–1 cup water. Serve with hot corn tortillas, lime wedges, and diced white onion. You’ll feel restored.